Urbini Baby has been around for a while already, but they’re making a name for themselves now with lines of strollers, car seats, and other baby and child products. And while car seats are part of their offerings, we’re going to focus on their strollers here. 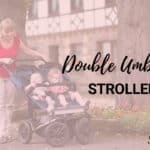 There are both standalone strollers and travel systems under the Urbini Baby umbrella, and we’ll look at both types here, then recommend what we’ve determined to be the best Urbini stroller available. 2.1 What’s the Difference Between the Infant Seats, Sonti and Petal? 2.2 Where Can I Get an Urbini Stroller? 2.3 Where Can I Get Replacement Parts? 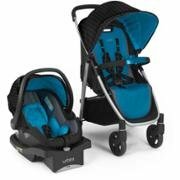 2.4 Can I Get the Travel System Stroller by Itself? 2.5 Where Are Urbini Strollers and Car Seats From? 3.0.1 Q: Can I use an Urbini Sonti car seat with a different brand car seat base? 3.0.2 Q: Can I get an Urbini stroller or car seat outside the US? There are a total of five stroller options with Urbini: three standalone models and two travel systems. Here’s more on all of them, including what we do and do not like. The Reversi gets its name from the stroller seat’s ability to flip around, making this stroller a convertible option for parents who want flexibility. And, like other Urbini strollers, this one accepts the brand’s infant seat, the Sonti, with the included adapter. This stroller may look like a traditional umbrella stroller, but it weighs about 20 pounds and can hold its own when it comes to carting around heavier toddlers—plus parents’ and kids’ essentials in the basket underneath. And while many strollers with this trim of a profile offer little in the way of parent storage, there is at least a cup holder on the Reversi so that parents can bring their beverages along. Another adjustable stroller which accommodates the Urbini infant car seat, this multi-position reclining stroller is adjustable and also a budget-friendly pick in terms of the features it offers. The seat accommodates children weighing up to 50 pounds, and it has a removable bar to keep kids in—and to support infant car seats in that mode. You don’t need an adapter to fit the Sonti on top of this stroller, and the canopy is sufficient to extend over the car seat completely. And although there’s still an absence of parent storage in the Swiftli, it has that same Urbini cupholder parents have come to love. 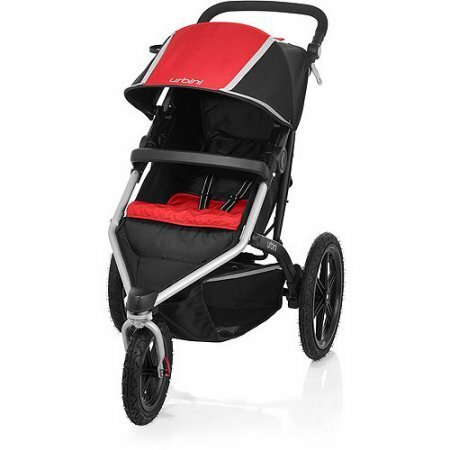 The Avi is Urbini’s contribution to the jogger-crossover stroller category, the brand’s only jogging option. In true jogger fashion, the stroller offers a swivel-lock front wheel plus a multi-position handle to suit parents of varying heights. Like other jogger strollers, the Avi is suitable for carrying kids up to 65 pounds, which makes for a strenuous workout if you’re pushing them while running! However, you will need to pay attention to the tire pressure, as the Avi uses inner tube tires that require regular maintenance. 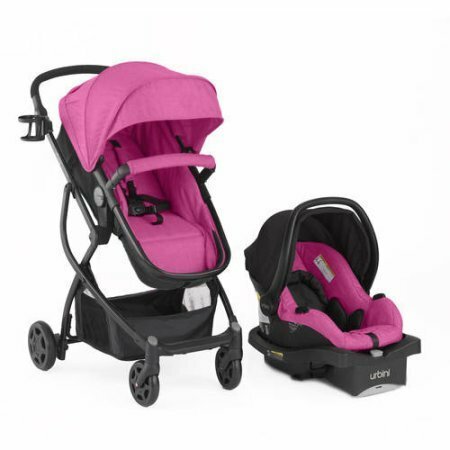 If you want to get both an infant car seat and stroller from Urbini, their Omni Plus travel system is the way to go. The system combines a reversible convertible stroller seat with an infant seat which is suitable for newborns. The convertible seat also becomes a bassinet/carriage for smaller babies and reclines flat accordingly. While it can be challenging to find an extra base for the Sonti infant seat, there is one base included with the travel system, so you can start using the seat and stroller immediately. This travel system combines the Sonti infant seat with the Turni stroller, which allows babies to face mom while riding in their car seats with the travel system. Parents can also turn the seat to face them without removing the stroller seat, which is helpful when you’re in a hurry. With the addition of the child tray, the stroller is also workable for older babies who are beyond needing an infant seat. The cupholder and small tray let you give your child snacks while on the go, but for smaller babies, there’s also the foldable footrest that switches the stroller into a bassinet-like mode. The brand has been around under its parent company for over 25 years, but there’s a lot that consumers may not know about Urbini Baby. Here’s what you need to know if you’re planning on buying a stroller or travel system from Urbini. What’s the Difference Between the Infant Seats, Sonti and Petal? 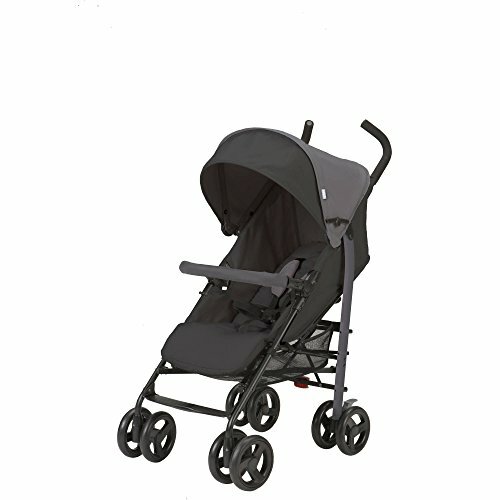 Although the Urbini website lists the Petal as a compatible seat with their Avi stroller, it’s not for sale online anymore. Clearly, the model was phased out, replaced by the consistently updated Sonti seat. However, some customers may still have an older Petal seat that hasn’t expired yet. Unfortunately, they won’t be able to use a newer Urbini stroller with it because of the upgrades that have happened since the Petal was launched. This can be a bit confusing for consumers, especially if you’re new to the brand. Where Can I Get an Urbini Stroller? 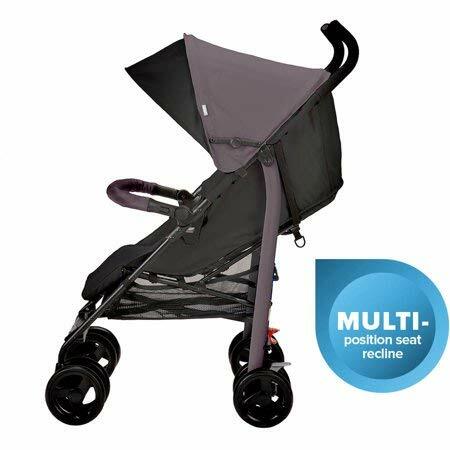 While most of Urbini’s strollers are available online via Amazon, they also have exclusive partnerships with Wal-Mart, which can be both a positive and a negative. 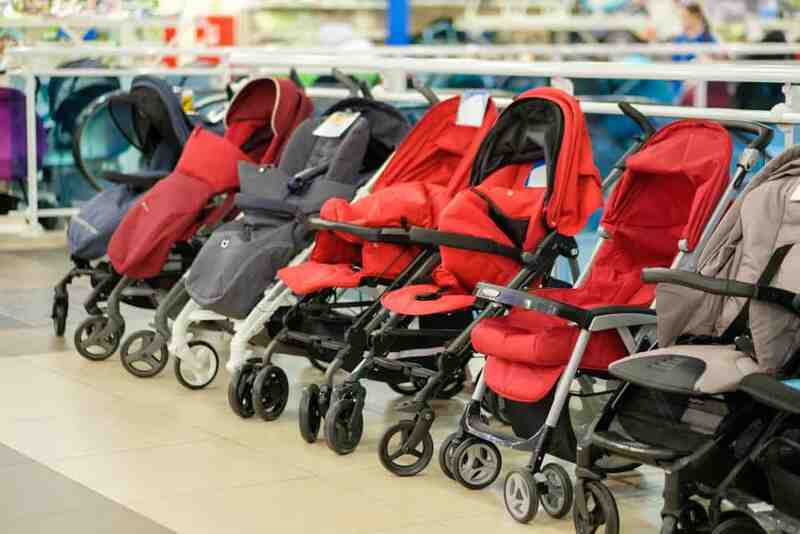 It’s nice to know you can grab a quality stroller (or car seat) while shopping at Wal-Mart, but it may also be tough to find the stroller you want online if your local store doesn’t carry it. Also, you may be paying extra if you purchase an Urbini stroller from a site that’s not affiliated with the brand itself. Customers have also noted it can be tough to track down an additional or replacement car seat base for the Sonti, which is another problem that can come up if you buy a travel system from Urbini. From what we can tell, Urbini is very active in the forum section of their website, where consumers can ask questions about products and air their concerns. In response to consumers requesting help with broken or missing parts, Urbini is eager to offer replacements and other solutions. Therefore, if you need a replacement part for an Urbini stroller, it’s a good idea to check with the manufacturer before trying to buy replacement parts online. 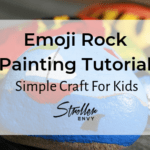 Especially when it comes to the Sonti car seat and its accessories, using brand-specific replacements can often affect the safety of the product. Need a part or have a question? Contact Urbini’s consumer care via their website for help. You can also find product manuals with specifications on their website, too, even for the discontinued Petal and other products. Can I Get the Travel System Stroller by Itself? On Urbini’s website, they list their travel systems separately from their stroller selections. This means they don’t sell those two strollers (the Omni Plus and the Turni) on their own. While the Sonti infant car seat is available by itself, the strollers it’s paired with don’t. You may be able to find these strollers separately from other retailers, but it’s possible they’re older versions or possibly used ones, which isn’t ideal. 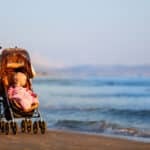 Therefore, we’d have to recommend against purchasing an Omni Plus or Turni stroller unless it’s in the travel system bundle via a reputable seller. Where Are Urbini Strollers and Car Seats From? Though Urbini is a relatively new name to most parents, they’ve been producing strollers and car seats for years. The brand’s parent company, Goodbaby International, has its headquarters in China. Goodbaby International also oversees brands like Cybex, Evenflo, and others—so they clearly know their stuff when it comes to baby and children’s products. However, the products Urbini sells are specific to unique markets. For example, Urbini’s website only addresses consumers in the United States, which means its travel system car seats are not suitable for consumers outside the US due to differences in laws and car seat safety tests. Here are a few commonly asked questions about Urbini Baby’s strollers and travel systems. Q: Can I use an Urbini Sonti car seat with a different brand car seat base? A: As with all infant car seats, it’s not recommended to use your seat with a different brand’s base. Therefore, you should only use the Sonti with a base manufactured by Urbini, unless otherwise specified by the brand itself in your user manual. Q: Can I get an Urbini stroller or car seat outside the US? A: For now, the Urbini Baby company only manufactures car seats and strollers for the North American market. That could change at some point, but for now, we’d have to suggest buying the car seat product that is licensed and tested in your home country. For strollers, there’s not such an emphasis on safety, as they’re not tested in the same way as car seats are. Although it’s tough to pick a favorite since all the Urbini strollers have great features, we’d have to recommend the Reversi. Unless you really need an infant car seat, it’s enough to pick from one of the brand’s standard strollers rather than a travel system. Which is why the Reversi is great—it’s compatible with the brand’s infant car seat, but it’s also a fully reclining stroller which works for babies from birth on up to 50 pounds. 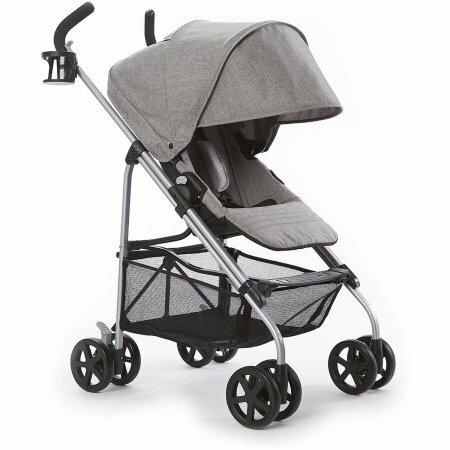 It looks like a standard umbrella stroller and has a similar profile when folded, but the features are enough for us to suggest this one for daily use from the newborn stage on. Ready to get one now? Head on over to Amazon for an Urbini Reversi right now!